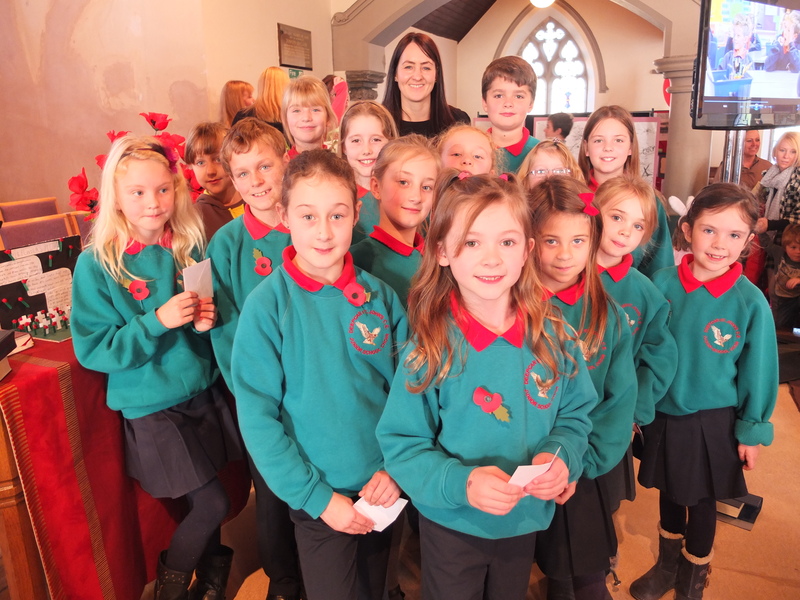 A choir from Deepcar St John’s Junior School was one of the highlights of a unique Remembrance Day service at Christ Church Stocksbridge on Remembrance Sunday. The choir sang two pieces as part of the service, led by their teacher, Jane Steward. Families and friends joined the congregation to hear them sing. Ian McMillan performed on film his new poem, “The Bridge”, which he has written specially to remember the dead from Christ Church and its former congregations. The film of Ian reading the poem, with its rich sounds and local place-names moved most people to tears. Charlotte Stones, a pupil at Stocksbridge High School, read a poem that she had written in one of the poetry and art workshops that Ian had run in the High School. All the poems and drawings that the High School pupils had produced in these workshops have been reproduced in a booklet produced by John Parry, the head of English at the High School, and everyone present was given a copy. The church was packed as nearly 200 people shared the service, and had a chance to explore the new Peace Chapel space with its five memorials from the first and second world wars, and lay poppies in a field of remembrance. The children all had to sit on the floor, when they weren’t showing their families and friends some of the work they had done in school, which was on display in the exhibition in church. The exhibition of children’s work from the three schools, Deepcar St John’s, Stocksbridge Junior School and Stocksbridge High School, will stay in Christ Church for a while, where it will be open to view on Sunday mornings, and then may transfer to the Stocksbridge Library for a short time.